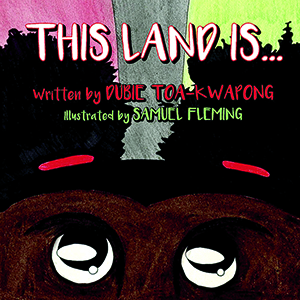 Three Mac friends team up to produce This Land Is, a children’s book designed to build empathy. 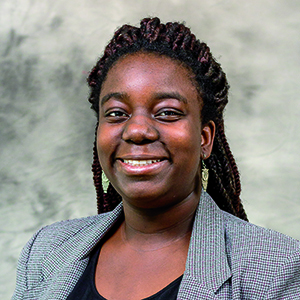 Last fall, Nana Adom Mills-Robertson ’18 needed honest feedback on a short manuscript. He chose an audience he knew wouldn’t mince words: commuters on public transit. The thing is, caring about one another’s feelings is actually the heart of the message Mills-Robertson was testing. In 2016, after hearing news reports about increased bullying in schools, he wanted to explore how to help kids build empathy. 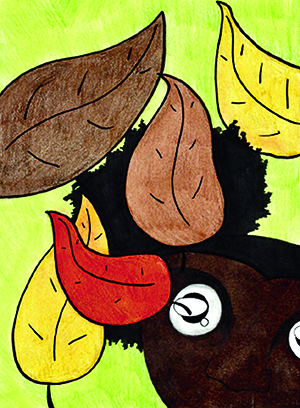 His solution: a book geared toward early-grade readers. But he needed a writer and an illustrator to make it happen. 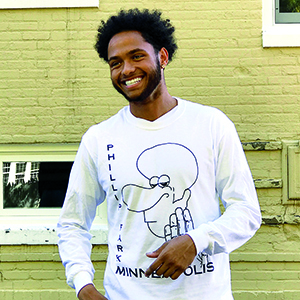 So Mills-Robertson teamed up with Mac friends whose skillsets in those areas he admired: writer Dubie Toa-Kwapong ’16, who had come to Macalester as a Davis United World College Scholar from Norway, and art major and illustrator Samuel Fleming ’19, who is from Minneapolis. Toa-Kwapong says she was drawn immediately to the empathy-building mission that Mills-Robertson pitched. “It was the aftermath of the  election and Brexit, I was feeling quite helpless and hopeless, and this felt like an effective way to engage and bring an important demographic into the conversation,” she says. Cover illustation by Samuel Fleming. As the three reflected on their hopes for the book, their plans expanded to include an accompanying curriculum for educators and parents. Their mission expanded, too: The team set a goal to build empathy among two million children around the United States, planning to assess their progress through book sales, curriculum downloads, and the amount of feedback generated on the book’s website. Poring over children’s books in Mac’s DeWitt Wallace Library, Toa-Kwapong began developing her story: Amina—an African American girl who lives in Minneapolis with her family—notices that some of her classmates have been treating her and some of her friends poorly because they’re different, bothering a boy who has two moms and pulling off a girl’s hijab at recess. Amina’s math teacher even laughs at her when she says she wants to be an astronaut. This shift makes her feel nervous about going to school. When her music class sings Woody Guthrie’s “This Land Is Your Land,” she wonders “if this land was made for people like Khadidja, Lester, Amadou, and me.” Amina’s mother reminds her that she and her friends aren’t alone, sharing stories about civil rights heroes and social justice champions who have gone before them. An interior illustation by Samuel Fleming. With Toa-Kwapong back in Norway working as a columnist for the publication Framtida, the trio turned to the next obstacle: a Kickstarter fundraiser. For most of the campaign, the outlook wasn’t promising. On the final day, well short of the $7,000 goal, the three brainstormed how they could move forward without Kickstarter support. (If a Kickstarter goal isn’t met, pledges are returned to each donor.) Then Mills-Robertson got a notification on his phone that the project had been fully funded. “I’m thinking it’s a glitch, maybe that someone’s messing with me,” he says. But there was no glitch: at the last minute, someone—unknown to the three, outside their networks—had stumbled across their campaign on the Kickstarter website and pledged $2,000 to complete the project. But progress wasn’t always linear. As Mills-Robertson waded through the self-publishing process during the end of his senior year, production costs exceeded preliminary estimates. He made mistakes. A self-professed “believer in audacious goals,” he realized that getting the books into the hands of two million kids came with its own set of challenges. And then there were the critics. For every few people who loved the book, he says, “I’d show it to someone who’d read it and look like they had tasted a lemon. I’d hear things like, ‘You can’t show this to kids,’ and ‘This is a heavy children’s book.’” But the three didn’t want to water down their story’s message, and they pushed forward. Earlier this year, the trio distributed the first batch of This Land Is with the Pajama Program, a national program that provides books and pajamas to at-risk youth. Mills-Robertson registered the project as an LLC, and he’s developing an online curriculum with assistance from open-source resources from the equity-focused organization Teaching Tolerance. The next step: Mills-Robertson, who works full-time as a market development representative at the software company Kipsu, will focus on getting This Land Is into libraries and bookstores (it’s also for sale at thislandbook.com).